That $100 million figure keeps holding on during the final weeks of California’s budget debate; that’s the amount of restored judicial branch funding that state lawmakers called for in their budget. Reading between the lines, it’s likely the most that courts advocates can hope for adding, and nobody expects it to stop the planned closures, although it might save a few jobs. Los Angeles County might expect up to $30 million of that fund, if it gets passed, according to a solid story in The Fresno Bee newspaper. The paper also reports that ongoing reorganization efforts for L.A. County are under way, and many of the closures and shifts are happening in June. Those moves should heat things up even more. Read the Fresno newspaper’s take on the situation here. That loud grinding sound you hear from the north is the legislature crunching numbers, and it looks like “100 million” is a key figure for the final weeks of California’s budget battles. The legislature is proposing restoring $100 million to the judicial budget, earmarking most of that for trial courts and screaming for increased accountability from the Administrative Office of the Courts. As a constituent and an attorney I am gravely concerned about the massive underfunding our judicial system has experienced over the last five years. While I understand our entire state has been reeling from the impact of the recession, our courts have taken a disproportionate share of the budget cuts. The result has been a deconstruction of our justice system impacting access to justice for our citizens. The time is now to reinvest in courts. Democracy stands in the balance. “That, I think, was the last hope,” the city manager told the paper. That’s chilling news as many courthouse workers and courts supporters press their case for last-minute budget increases before a June 15 budget deadline. Lawmakers frequently miss the deadline, but it is still seen as a key milestone in final budget negotiations. 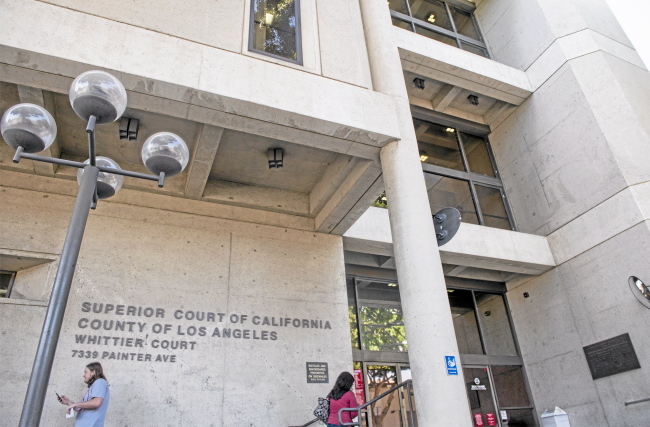 Following the June 3 date, some staff will be at the Whittier courthouse, but the building will not be open for court business, according to Mary Hearn, director of public information for the Los Angeles Superior Court, who was quoted in the newspaper’s story. How complex will it get? The Daily News lists the details: Whittier cases have been or will be transferred to courthouses in Los Angeles, Long Beach, Chatsworth, Norwalk, Bellflower and Downey, depending on the type of case and in some cases, depending on the person’s ZIP code. Traffic tickets issued by Whittier police will be heard in Bellflower. L.A. Sheriff’s Department and CHP tickets will be heard in Downey. Felonies will be heard in Norwalk, but only after the arraignment stage. Felonies filed by Whittier police will be arraigned in Bellflower, with sheriff’s and CHP cases in Downey. After arraignment they will be transferred to Norwalk for preliminary hearing and trial or the Early Disposition Program, or a plea bargain. Simple enough. No way that’s going to confuse anyone’s day. Read the Whittier Daily News story, Final nails in Whittier courthouse’s coffin. Sonya Farnsworth, a Stockton courthouse clerk and president of the Local, and Jennifer Whitlock, a court reporter for the San Joanquin court and a member of the Local’s bargaining team, called for supporting state Rep. Cathleen Galgiani (D-Stockton) in efforts to restore court budget cuts. “We must help her to build a public outcry for funding that maintains the integrity of our justice system,” the duo wrote. They list a few of the worst service cuts for Stockton-area citizens: “Small claims cases are no longer heard anywhere in San Joaquin County. You can no longer access court records online for family law, juvenile, guardianship, mental or criminal proceedings.” They are also among organized labor voices statewide starting to increase pressure on the budget process. Read the commentary here. California is being increasingly seen as a national “leader” in the negative implications of court budget cuts, and a recent NPR story focused on the small claims system. Calling small claims a “workhorse,” NPR explained that they “… were created in the mid-20th century to allow people to resolve monetary disputes that are small in the greater scheme of things but huge to people of limited means. This AP photo is part of the NPR reporting on the court funding crisis. The network also noted how the courts work: “… they’re unique in how efficient they are. Defendants and plaintiffs don’t need a lawyer and judges usually make their rulings on the spot, often in 30 minutes or less.” But the report focuses on a charter fishing boat owner who has been dealing with a bad check case for months. The problem is that his court, in Stockton, hasn’t set a trial date for ANY small claims cases since September, and it has not target for resuming setting trial dates. The report includes noting the problems in Los Angeles. It’s worth a read, if only to remind ourselves that the Golden State is fast becoming a national leader in negative court news. Read it, or listen to it, here. It sure looks like the jury is still out for courts funding. The bad news from Gov. Brown’s latest budget draft raises a question: Is that the real number for increasing courts spending, namely “zero,” or just the latest negotiation move? Judging by reaction, it’s most likely the later as we move toward a June 15constitutional deadline for the “final” budget from lawmakers. But Chief Justice Tani Cantil-Sakauye is reacting as though the budget numbers could change. And Assembly Speaker John Perez, who if from Los Angeles and has strong union ties, is calling for protecting court funding – but it seems unclear exactly what that means. This is all a sure bet to heat up in coming weeks, and here’s an excellent recap from the Courthouse News Service. The latest draft of Gov. Brown’s budget, called a “good news” budget by some media because of increased revenues from a statewide tax increase approved last November and the improving economy, is less than good for the state’s justice system. The Associated Press and others are still developing their analysis, but the courts funding seems locked in at previous-year spending. Here’s a breaking budget story from the San Jose Mercury News. Here’s how bad it’s getting for California courts amid the closures and cutbacks: the Whittier Law School in Costa Mesa is offering to lend its new 4,400-square-foot “practice courtroom” to the actual courts, even offering to hold trials there. The courtroom opened last month amid much fanfare, and California Chief Justice Tani G. Cantil-Sakauye spoke at opening ceremonies. It’s also an example of walking the talk, because much of the funding for the $2-million facility, according to the Los Angeles Times, came from Whittier graduate Paul Kiesel, who is also co-chairman of the Open Courts Coalition, the bipartisan lawyers group lobbying to reverse California’s years of court budget cuts. 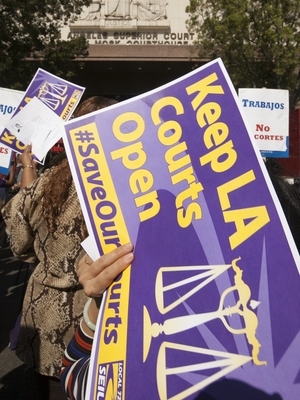 “In the last five years,” Kiesel told the Times, “the courts’ budget has been cut by $1 billion.” He said the cuts have resulted in a backlog of 20,000 personal-injury cases in Los Angeles County alone. You can read the LA Times story here. Exactly on cue, opposition views are starting to emerge in advance of Gov. 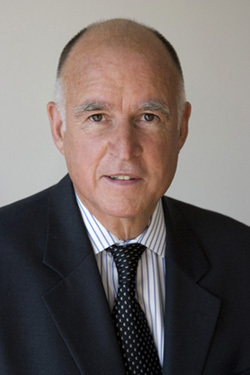 Brown’s next draft of a state budget, which is expected next week. The Los Angeles Times is reporting that state Assembly Speaker John A. Pérez, a Democrat and former union political director from L.A., lists increased courts funding among his concerns. The news brought quick comment from Chief Justice Tani G. Cantil-Sakauye, who has called upon lawmakers to invest in the justice system. The speaker’s comments are hardly casual. The “ideas” were developed along with his fellow members of the Assembly Democratic Caucus and came during a speech to the Sacramento Press Club. That means it’s another step toward the state budget debate that begins for real when Brown releases the next version of his spending plan. Read about other issues in the complete LA Times story here.